I went to Cape Girardeau, Missouri this past week to pick up my circular sock knitting machine and participate in the Annual Open House and crank-in that is sponsored by the Erlbacher Gearhart Knitting Machine Company. 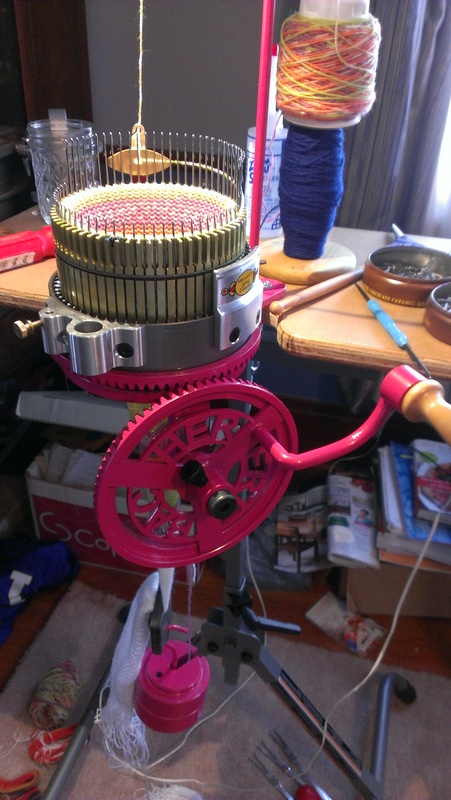 They make reproductions of the antique Gearhart sock knitting machines that I have mentioned previously. I love to hand knit socks, but cannot keep up with my family’s demand much less make enough to sell. 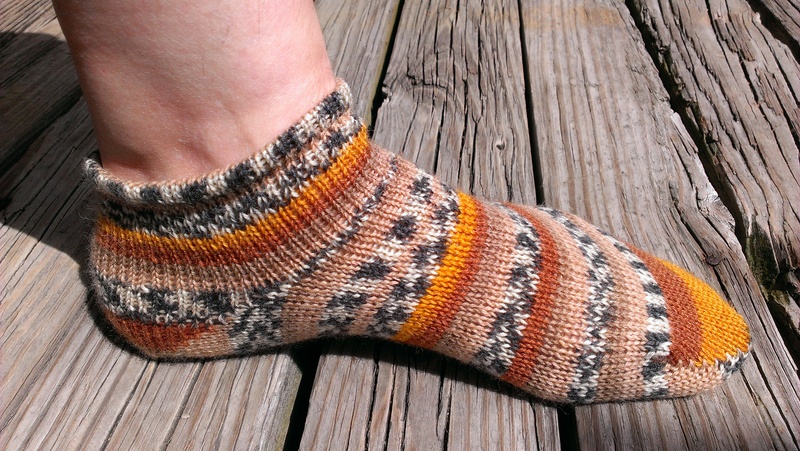 Socks also take long enough to knit that a pair would cost over $100 to make it worth my while to sell them. Since one of my goals is sales, I wanted a hand cranked machine that worked correctly right at the start. I also wanted one that I could easily get extra cylinders and ribbers for so I can make different sizes. For those reasons, I chose to buy a new one instead of an antique. Their usual models of the machine come in green and yellow (think John Deere colors) or red. 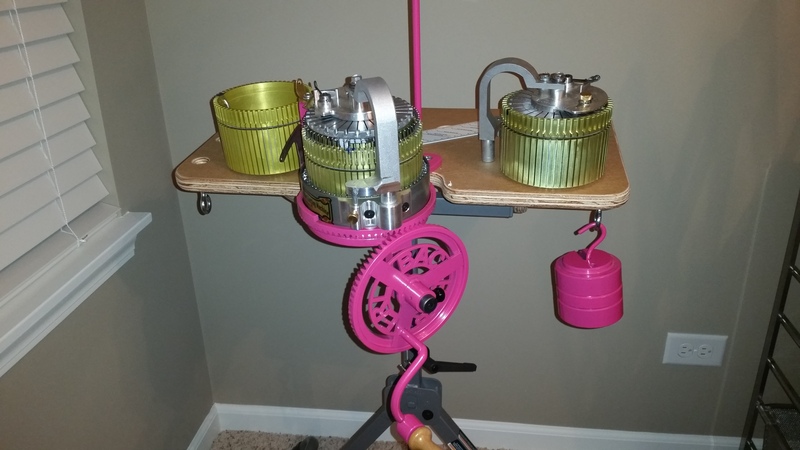 I got one of their last Pink Lady machines, a special paint job on 25 of them. Part of the profits went to support a fundraiser in honor of a friend of the Erlbacher family who died of breast cancer. The money would be used to help fund mammograms and support breast cancer patients in need. A woman in Chicago had purchased the machine, but after 2 or 3 weeks decided she did not like knitting on a machine and preferred to knit her socks by hand after all. (The Erlbachers refer to this as “stick knitting”.) So I got it at a good price with some extras. I had a great time there and learned the basics of how to use the machine. In fact, I even learned how to use the ribber which is something they don’t recommend learning until you have knit a few sock with a turned hem and stockinette or mock rib leg. I decided to make sure I knew how to use it while I had someone by my side to help and to make sure my machine worked correctly with the ribber dial on. I am currently working on the matching sock to the one I knit at the crank-in. Here is a little movie of it in action.